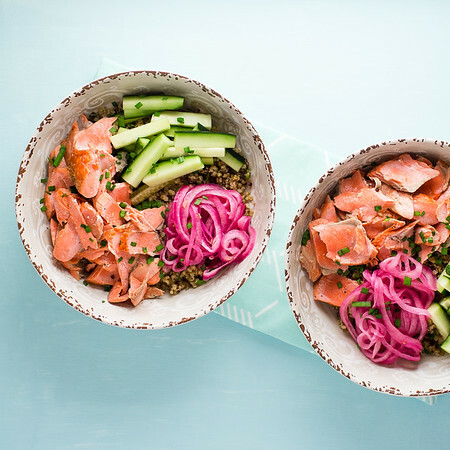 Whether you call this a Salmon Bowl or a Brown Rice Bowl, you’re going to call it delicious! 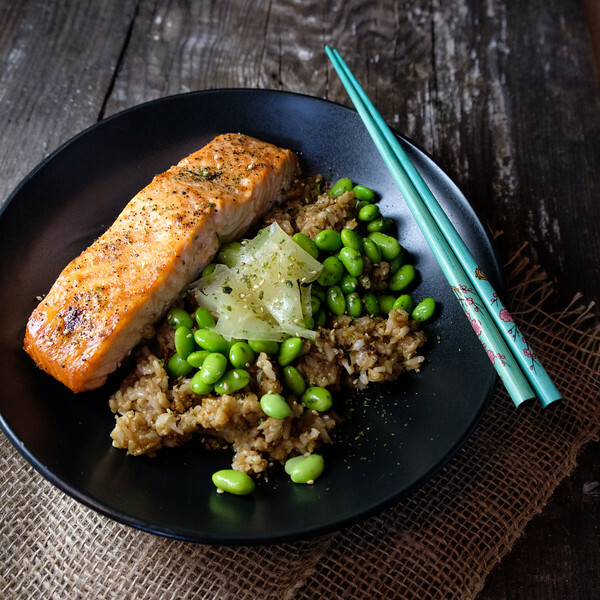 This Salmon Bowl with Brown Rice and Edamame is easy and healthy! I’m getting ready to go to my physical this year. I just turned 60 in May, so I am expecting there to be a slew of new tests. It seems like every milestone birthday lately has added some new test that I have to have. I’m not complaining, I feel blessed that I have access to preventative health care. I am also trying to do my part to stay healthy. I try to do yoga four to five times a week, I use Yoga with Adriene. I try to get a little hike or something fun in on the weekends. So far that seems to be working good for me. I know I should do more cardio, but I really love the yoga, and I really don’t love cardio. I also am really trying to eat healthy through the week. Easy healthy recipes like: Healthy Chicken and Corn Nachos or Glazed Salmon with Zucchini and Bulgur. I relax a bit on the weekends…hello super deluxe pizza. 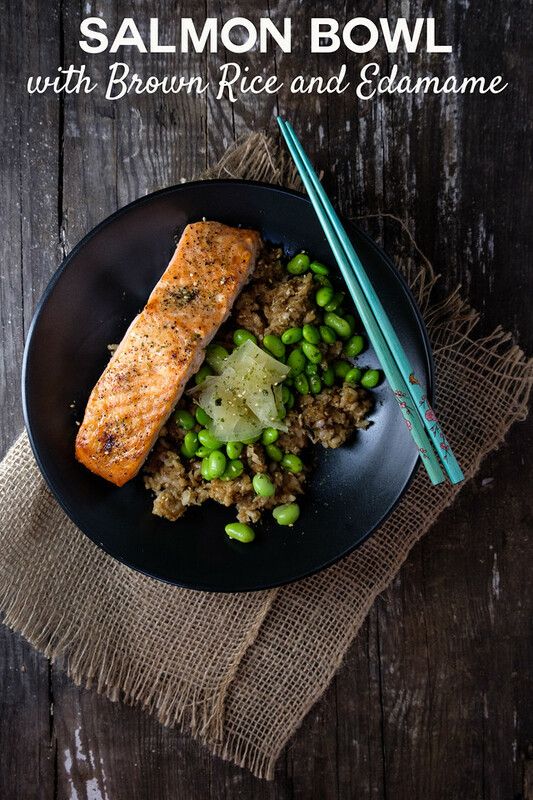 The healthy recipes can be hit or miss, but this Edamame Brown Rice Bowl with Salmon is a huge hit. Really. I could eat it every day. I found the basic recipe for Japanese-Style Fried Rice in Donna Hay’s April May 2016 issue. I modified it a bit and included a simple broiled salmon. It is amazing how these few simple ingredients can make something so good! The seasonings in the rice: sesame oil, mirin, soy sauce, and togarashi are amazing. I will turn to that again and again to flavor my rice. The recipe called for sprinkling the togarashi on top, but I mixed it in with the rice. If you’ve never had togarashi, you have to try it. It’s hot and spicy and wonderful. It’s a blend of chili pepper, orange peel, black sesame seed, seaweed, white sesame seed, Japanese pepper, and ginger. Speaking of ginger, the pickled ginger was the perfect condiment for this. The recipe calls for cooked brown rice and I used my trusty old rice cooker – I bought that rice cooker when we adopted our daughters from Vietnam 1994 and it is still going strong! 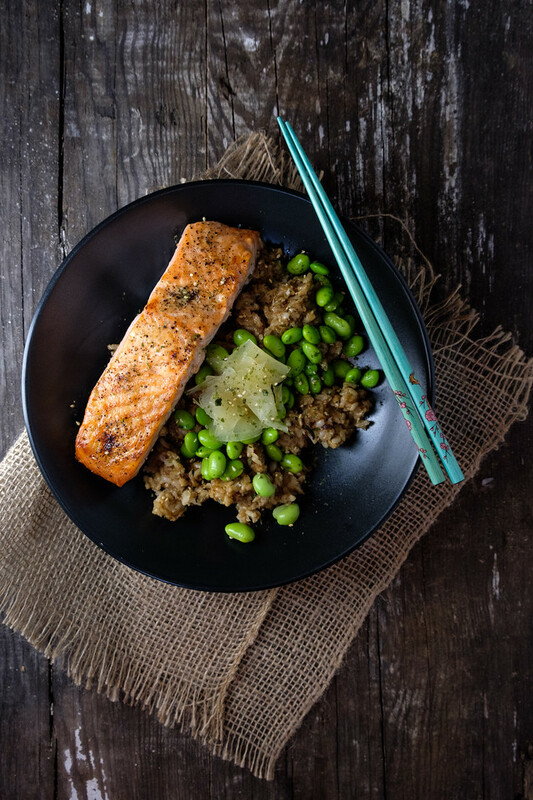 This Salmon with Ginger Quinoa will become a family favorite! It also makes a great lunch and perfect for meal prep! 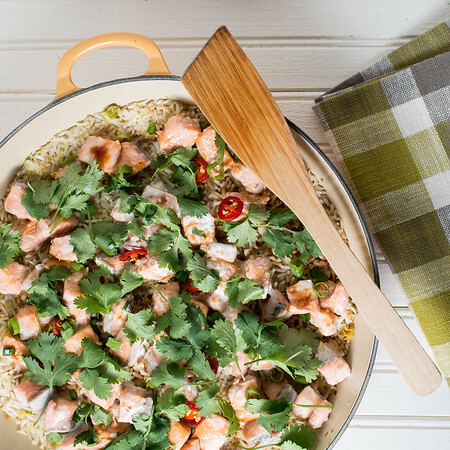 This Edamame Brown Rice Bowl with Salmon is so easy and tastes amazing! Preheat broiler. 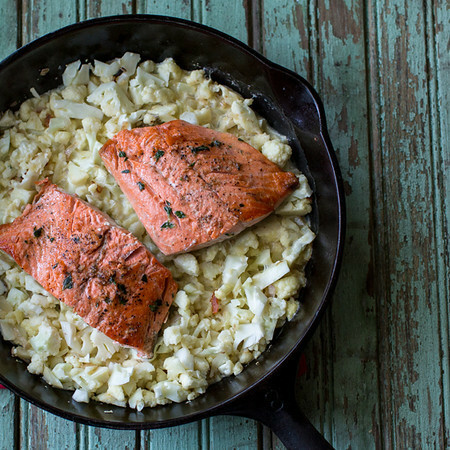 Line a small sheet pan with foil and place salmon on it. Brush with oil and season lightly with salt and pepper. Broil about 8 inches from the heat for 6 minutes or until salmon is cooked to your liking. Remove and set aside. Heat the sesame oil in a wok over high heat. Add the rice and cook, stirring for about 2 minutes. Add the mirin, soy sauce and togarashi and cook for another 2-3 minutes. Divide the rice between two bowls. Top with the edamame and pickled ginger, and additional sesame seeds. What a wonderful bowl of goodness, this looks fantastic! Thanks so much for sharing with us at Full Plate Thursday. Hope you have a great week and come back to see us real soon! I really must give those edamame beans a try. Do you think quinoa would work in this dish? I just love that so delicious looking dish. Can’t wait to make it for dinner:) Thanks for sharing. Eating healthier is certainly a great way to stay ahead of the health issues you can try to control. I’ve found “splurging” every now and again is just as important. I’d have to say this meal fits in both categories for me, I know it sounds silly but right at the moment I’d much rather have this meal rather than dessert!!! Oh yummy. What a lovely meal this would be.